The period of time between July and August is mainly a black hole for mobile and web developers. While the majority of people are enjoying their summer and trying to forget about work, there are those who are interested in expanding their network, finding new clients, partners or angels. For these dedicated individuals, we have assembled a list of the hottest June-August 2017 tech conferences that you can take part in. 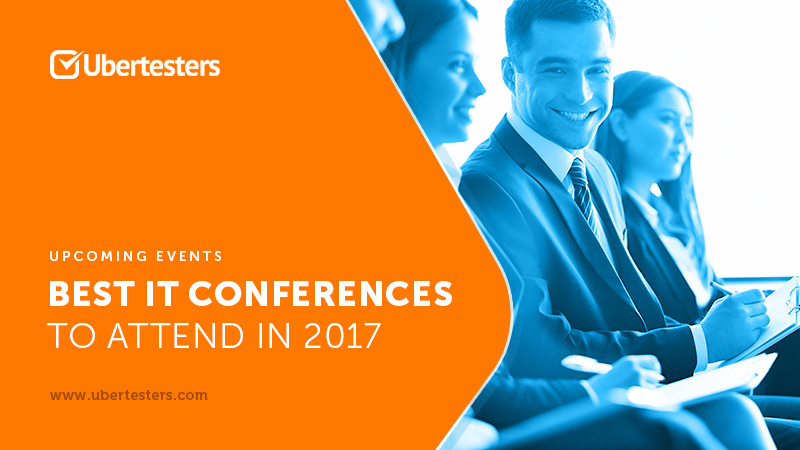 If you want to exchange personal experiences with your colleagues, present your ideas to an IT-crew and get funded, then this list of the best IT conferences to attend in 2017 is perfect for you. Agile Dev West and East will gather world-class specialists in one place for four (4) working days. You will discover the latest in agile methods, technologies, and tools for your apps development and testing. Jeffery Payne is the CEO and founder of Coveros, Inc. The Israel Mobile Summit is the premier annual mobile event of Israel. The event is attended by over 2,000 of the best and brightest mobile minds across the globe. This year the IMS organizers will open a startup arena where the best app developers, mobile startups and game publishers will be featured. Partners: MoPub, AppsFlyer, PayPal, Tapgerine. Take a note: This year the Ubertesters team will take part in the IMS 2017 conference. Our managers can help your business make and execute the right testing strategy, aiding the growth of your ROI for you app.. If you want to book a meeting, click here. This year Spark Summit will gather more than 3,000 Apache Spark engineers, analysts, scientists, and business professionals. You can join 6 training courses, 179 sessions and take part in 11 session tracks. Apps World returns as a part of London Tech Week’s new festival of technology ‘TechXLR8’ – showcasing a paradigm shift in the digital services industry. AW 2017 will bring together brands, developers and enterprises who are innovating in a multiplatform ecosystem and are interested in learning more about personal assistants, conversational commerce and Chatbots which aid in maximizing the accuracy and effectiveness of consumer engagement. Take a note: Meet the Ubertesters team at Apps World 2017. Click here to book a meeting with us. Pricing: €120 – €245 (excl. VAT). VivaTech is a hub for the world’s innovators, tech-lovers and pioneers of the future. It exists to create relationships that will change the future of business that operates in the IT domain. This year Viva Tech will gather more than 200 speakers and 1000 startups. Partners: Google, Orange, BNP Paribas, Sanofi. Inspirefest is a unique international festival of technology, science, design and the arts, covering key trends from Infosec to Blockchain, AI to Robotics, and Games to Professional Development. You will have a chance to make incredible connections with your peers and like-minded industry professionals. Probably one of the biggest Android-related events just after Google I/O. AnDevCon is the technical conference for professional software developers and engineers developing on the Android platform. During these three working days, you will take your Android development skills to the next level with in-depth Android development tutorials, classes and hackathons. Partners: Clutch, DC Android, Android Tech News, Linux Journal. Now in its 20th year, Black Hat is the world’s leading information security event, providing attendees with the very latest in research, development and trends. If you want to know how to protect your mobile app’s users’ personal and financial data, there is no other option than to book a flight to New York and attend this conference. Respawn is the biggest game developers conference during the month of August in Central Europe. More than 1500 attendees specialize in Mobile, Web, platform and lite-pocket games. The conference’s topics range from game design, and development and testing, to business development and game promo. We have put together a list of things that you should always remember to take with you to every conference. Print it out! Attending an IT conference is a great opportunity to grow your business network, and to travel and meet your development partners from all over the world. Follow us to get details about the hottest testing tips and events, and don’t forget to follow our blog. If you didn’t find an event and you would like to add one to the list, then send your request to support@ubertesters.com. ? Taxi booking app testing: how to make an app like Uber?